If you have plans to explore Acadia National Park then we’ve got the app to help you out. 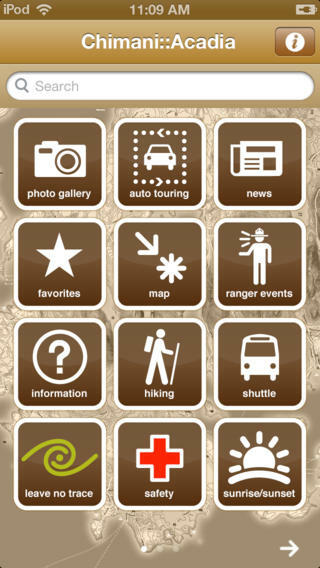 The Chimani Acadia National Park app for your iPod touch, iPhone, and iPad can be used before and during your visit to make the most of your time there. This app is absolutely brimming with useful and interesting information about the park, written by a professional travel writer. This means you’ll get a different spin on the park’s attractions than what you’d read on the official Park Service website. Chimani is known for their incredibly useful and high-quality guides and this one is no exception. You will find more than 300 points of interest, professional photographs, an audio tour, information on the more than 45 hiking trails, and so much more. It is literally everything you could ever hope to read regarding Acadia National Park, allowing you to create a perfect itinerary for your visit. There are even maps that can be accessed offline, perfect for while you’re exploring the park. They will show you all the roads, trails, and there is a “where am I” GPS function. Turn on the Points of Interest layer to highlight all the areas right on your map. Acadia National Park is a beautiful place to visit but is also massive so without helpful information like this there is a good chance you could miss out on some of the park’s highlights. The saying of “it’s a wealth of information” is perfect when describing this app. There are descriptions and locations for every picnic area, parking lot, and restroom in the entire park. Check out the tidal data that has been collected for many years now as well as the sunrise and sunset data. A great and fun way to explore is with the 35-minute audio tour or by using the Park Loop Road that features more than 28 points of interest. Did you know the park rangers hold events on a regular basis? Well thanks to the app you can read about them and view a schedule. There is also a free Island Explorer shuttle bus for which the app provides the schedule. I do find the user interface to be a bit of a letdown as it just feels rather dull. Because the app is so full of information you’re willing to overlook the user interface. It’s also easy to navigate, which is another big plus. The Chimani Acadia National Park app for your iPod touch, iPad, and iPhone is a great companion tool for anyone visiting Acadia National Park who wants to be sure he or she sees all there is to see. Next Post Does the IOS app use GPS to show your location on the park maps?